These are wonderful sheets! I especially like the wide elastic in the fitted sheet. I purchased the “split king set” when we first got our King adjustable bed they are generously sized and have the feel of very thick soft cotton. I have bought more expensive sheets elsewhere but none nicer. The gorgeously designed Maywood Duvet Cover is enthusiastically rich with its elegant style that will complement any bedroom in your home. Sleep in everlasting comfort and style in the vivid blue tones and majestic printed design. 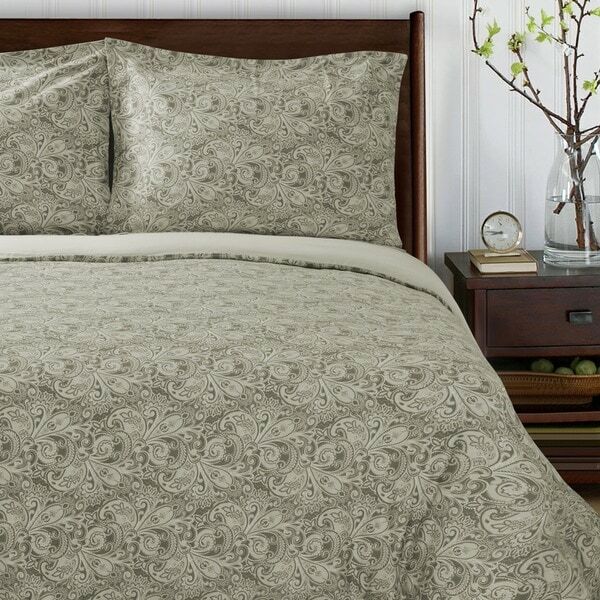 This 300 thread count duvet cover is made with the highest quality 100-percent premium cotton at an outstanding value. You can mix and match any solid color sheets and pillowcases to your style preference from our bedding collection sold separately. Dimensions 13 in. x 4 in. x 10 in. I have been using Superior products for past few years. Specifically Duvet covers have been so great to replace the looks of my old comforters throughout the bedrooms. When my friend brought a new home this came up in my mind as a perfect gift for them. They are using it for few months now... and they always keep praising it whenever we visit them. The size and fit seems to be perfect for their comforter. and it looks great in their bedroom as seen on the pictures they shared with us. Recommend a buy. I really like this duvet cover. Pattern is great! Love the feel and look of it. I was afraid that it might have a shine to it but it doesn't. Nice quality for the price! This is my first duvet cover, and I am thrilled. The comforter we were using was of good size and weight, so we are glad to keep it in use with a new look. The pattern is pleasant, and the quality is in every way quite nice, while the material is heavy weight. It is sized generously with plenty of room for a larger than usual king size comforter. It exceeds my hopes. I'm a very happy shopper with this duvet cover. Very good quality, great color, very affordable. Perfect way to update the bedroom without buying a new blanket. Purchased this in the blue color for my daughters room and she loved it. Looking to purchase one for me. Color was true to what was pictured. Color was true to what was pictured. Good quality. Good value. Beautiful quality . Great price. Arrived in time. Loved the quaility. Very soft. Had a slight odor when unwrapped but a quick wash before using fixed that and it didn't need ironing. A great plus! Didn't realize it had beige tones interwoven with the gray but I really liked that. Gave me a another neutral color to work with. Love it! Nice quality. Not too feminine which is what my partner requested. I liked the pattern, that it is only the cover with pillow shams (no extra decorative pillows I do not use), that the gray color would work well with my black sheets, and that it is not the material several of the others were with reviews of snags and thread pulls. I love this Duvet cover. Great vibrant color and no fading. This is my second one for my Airbnb just to have incase they stop carrying this. "Is the "Maywood Blue" a blue or a purple? It looks purple in the pictures. Thanks!" It features light and dark blue tones. "Will the King/Cal King fit too loose for a King size comforter?" It will work with a King. "What is the reverse of this? Is it the same pattern or a solid?" The reverse is a solid beige tone.